The day before yesterday, the weather forecast for the area was favorable for venturing out and continuing the trip. By then, our visas were four days delinquent. Oh my, I hear that Mexican jails are still not the best place to Do Nothing, Really Well. We were up at 5:00 AM and underway by 6:00. The sun was just rising as we approached the reef and we could see that the seas were still running pretty big. As we committed the boats, there were occasional 10 foot swells rolling through the cut, but the depth was over 25 feet and we were pretty certain that it would not be so rough in the deep water. In fact, when we went off soundings (greater than 500 feet) about ½ mile off shore, the swells were 8 ft, but with good breadth and lots of time between them. So off we went with a hard 80 miles to go. Our destination for the day was to be Xcalak (pronounced eeshkalak). It is the last place going south to check out of the country. Offshore about ¾ mile, the opposing Gulf Stream current slowed our speed to a miserable 4.5 knots. At that rate there would be no way that we could make the Xcalak before dark. So, we came in close and ran parallel to and a few hundred yards of off the barrier reef. There, the coastal counter current added a knot or two to our normal speed. If everything went just right, we could make it to Xcalak by 5:00 PM. If not, we would have to stay offshore all night and orbit as the reef passage would be too dangerous in the dark. It was a great days cruise, and quite technical too. Every hour, we checked our position, speed and estimated time of arrival. Sometimes when there was curved bay-like feature, we had to judge if it would be better to use the coastal current or make a bee line for the next point. At 3:00 PM, it looked like our fate was going to be too close to call. At 4:45 PM, we were able to make contact with the Xcalak Port Captain on VHF radio. He then contacted a local dive boat who gave us good instructions for crossing the reef. At 5:20, 10 minutes before sundown, we slipped through the break in the reef and anchored. At 5:45, the Mexican Navy dinghied over and boarded us. They were really very nice and completed their business in about 10 minutes. From talking to the locals, the drug traffic by boat in the area was really bad. Bales of marijuana often wash up on the beaches after drug boats, being pursued, scuttle their loads. We then had happy hour, and these little buckaroos hung up their guns for the night. Next day we visited Xcalak. It's a neat little village of maybe 1000 folks. We were met at the dock by a couple that had built a small hotel a few mile north. They had seen us motoring by the previous evening and welcomed us on the radio. We also met Mike of Marina Mike's who helped us a lot with the visa problem. He explained to the officials that the weather was too dangerous for us to move, so the expired visa thing was an act of God. The Port Captain agreed, Immigration did not. That will be $10 per person thank you. Actually, that wasn't too bad. Normally an expired visa costs $15 per day, per person. 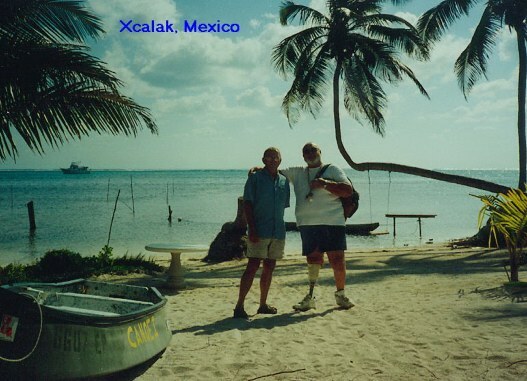 Finally, completing the Mexican check out, we left beautiful little Xcalak at about noon. 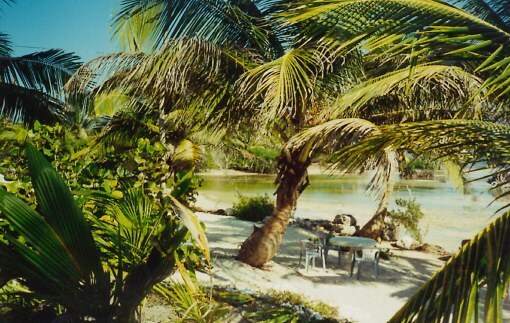 From there, it was only 24 miles to Ambergris Cay, Belize and the town of San Pedro (pop. 2000) which Joan and I had visited several times in the 1980s. The cruise was very pleasant with only 6 foot seas and lots of sun. Its about 5:00 PM now and we have anchored among seven sailboats, including Estralita, Driftwood and Someday whom we had met at previous anchorages. Maggie slept all day. She wedged herself in between cushions or pillows or something and dreamt of rabbits and Tibetan splendor or something. Francesca and Heide have been running almost perfectly. We have caught a few good food fish while trolling, but nothing really to write about. I think that is about to change. We're really tickled to be here. Belize has good beer, a great barrier reef, excellent diving and snorkeling, 4000 islands to visit, cheap lobster and lots of fish. For the next 140 miles, we will be cruising inside of the barrier reef, except when we go to the offshore archipelagos (there are two). We expect to spend two or three months in Belize before continuing to Guatemala. Did I mention that the waters are beautifully clear, lots of palms and coconuts, and nothing happens very fast. A great place to Do Nothing. . . .